Ask the Readers: Is it OK to give used gifts? Hi there, Mr. and Mrs. 1500 doing another tag-team question this morning, asking if you think it is ever ok to give a used gift. We are talking about an obviously used item, not just regifting, which we have already discussed and given blessings to do so. Is it ok to give this as a gift? But first, let’s talk about your goals. Last week I asked about your goals for 2014, and shared some of mine, including our collective monthly challenges. Done by Forty has five goals this year: buy a rental property, launch Personal Training for Your Pocketbook and get 8 clients, work out for 313 days of the year, lose 15 pounds, and to learn 3 songs on the guitar or keyboard. I was curious about that odd number 313. Turns out he gets one cheat day per week for the entire year. Makes sense! Good luck DbF! Fast Weekly‘s goal is to have a have a healthy baby boy in March. (Looks like he got a Very Fast start on that goal!) Congratulations! theFIREstarter has these goals: Grow blog traffic and try to write some decent articles, save at least 50% of income, set up a proper financial independence plan, learn more about investing and taxes, learn more about environmental, social, economic and political issues, get fitter! Prudence Debtfree is trying to pay down her husband’s business debt. Last year she made a sizeable dent, bringing it down to $48,000 from $80,800! Wow! Let’s hear a huge congratulations for her! Elroy from Moi and Money is ALSO having a baby. (Look for this trend to MISS the 1500’s house completely!) Congratulations Elroy and Mrs. Elroy! So now on to this week’s question, Is it ever OK to give used gifts? Take it away, Mr. 1500! A couple years ago, I was at the birthday party of a young nephew. Everyone brought gifts, but the one that my aunt and uncle brought was the most interesting. I watched as they pulled a tricycle out of their trunk and placed it next to the other gifts. I went over to take a look at it and it was clearly used. The tricycle was still in good shape, but had a couple scratches. My aunt saw me looking at it and explained that they had picked it up from a neighbor’s garage sale. I looked it over and noticed that it was a very nice little machine. It was made in Germany and was very solidly built. My nephew would be able to get a lot of use from it and then pass it on to siblings or other family members. The thought that went through my head was this: I’d rather receive a high quality used gift like this than something disposable that would be broken in 3 months. However, I wonder if my nephews parents would feel the same way. I did think it was a bit strange giving someone a used gift. (Mrs. 1500 again) I went to a baby shower for a friend in Madison, WI, which is the hippie capital of the world. Everyone there uses cloth diapers, makes their own organic baby food, recycles everything and has a backyard compost bin. But when one of the ladies produced an almost unused baby outfit that was absolutely perfect for the new baby, and declared she found it at a garage sale, there was a silent, collective gasp at the audacity of bringing a used item as a gift. As I bought all my children’s clothes at garage sales, I didn’t think anything of this, but some of the other moms, who spent vast sums on their own children’s clothes very obviously felt this was a mistake. But our whole reason for asking is this, we found a very nice, high-quality used bike for our oldest daughter. 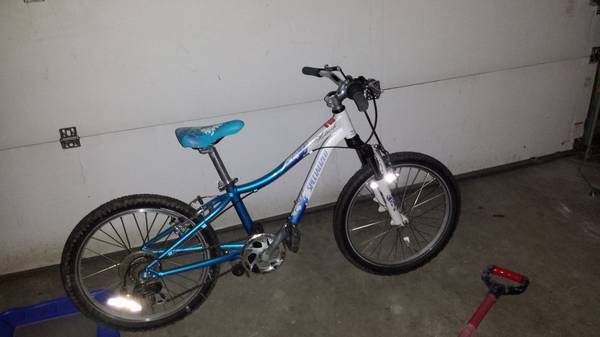 Her birthday is in a few weeks, and we want to get her a bike that fits, without spending a whole ton of money. Would you ever give a used gift? To me, a used gift is a little weird. And I think that is bad on my part. I don’t think I SHOULD view it as weird. I actually like the idea of giving a used gift to your own daughter. She gets a great gift AND learns that used gifts are ok, a lesson that I never learned and have to work on. It seems weird to me, too. It totally shouldn’t, and when there is no occasion, I don’t care at all about buying something from a garage sale/thrift store. “Hey, I saw this and thought of you. Since it can’t be returned, it is ALWAYS something I know they will use/like/appreciate. Except that one time I found a pristine copy of the “Dinner in a Dish” cookbook that my mother cooked from religiously throughout my childhood. Her copy had fallen apart, and this one looked brand new and was spiral bound. My mother did not want this. I couldn’t figure out why. I think this really depends on the gift itself and the recipient. This Christmas in our family, someone gave used technology as a gift – they just stuck it in a bag and called it a day. I don’t think there’s anything wrong with giving old technology away, but I think that sort of stuff (outdated devices that can’t be traded in) should be freely given without occasion. It sort of rubbed me the wrong way because it came across as someone trying to get away with not spending any money on a Christmas present – it seemed much more cheap than frugal to me. A very good point to make. There is a difference between frugal and cheap. I would never give a used gift to be cheap, but why pay full price when you don’t have to. Which sounds totally cheap! ARGGH! Where is the line? I don’t think I could spend $100 on just any birthday gift, but she is turning 7 and has outgrown her current bike. This is a very high quality bike but I would not drop $300 on a new one. My grandfather gave me a used bike for my birthday last year, and that was fine by me. He has become an avid bicyclist, and had just gotten a new bike so he didn’t have any use for his old-but-still-practically-new-in-great-shape bike. I didn’t have a bike and liked the idea of having one, so I was pleased to receive it. I think it depends on who’s getting the gift. Some people are okay with purchasing used and don’t think anything of it. If it had been me at that baby shower, I would have given the outfit and just not said anything about where it came from. Yes, I was a little surprised that she announced its origin. You are right, it depends on who is receiving the gift and what it is. I know that if my sister received a used gift, she would absolutely NOT be happy with it. Rather than accept it in the spirit in which it was given – “Hey, I saw this and thought you would like it” – she would be offended that I didn’t buy new. She thinks we are swimming in cash, and should therefore spend freely. The apple fell really far from the tree there. I think it depends a lot on the context. When my brother and sister received new bikes on Christmas morning and I got a hand-me-down and a can of spray paint it felt pretty awful right then. But the past few years a large chunk of the gifts we get from Mr PoP’s folks have come from the thrift store, flea market, consignment ship, or (their favorite for spendy presents) the pawn shop. For us, we’d rather like the gift than worry about its origins. It still makes me sad to hear this story, even though I have heard it before. 🙁 If all of you received hand me down bikes, that would be fine. If you all received new bikes, all good there, too. But only one of you gets the hand me down bike, that is wrong wrong wrong. Poor littlest 1500 gets everything used. The older one is so gentle with everything, that it arrives in pristine condition. The younger one absolutely destroys everything, so there isn’t much to hand down to anyone. Good thing about their birth order! More than ok, especially for immediate family and children. I picked up an awesome boy’s 16″ Trek bike for 25% of the original cost on Craigslist. It’s world’s better than a new bike of equivalent cost (think Walmart) and my kids have never asked if something is new. I think that’s definitely some sort of stigma that adults carry around. I have recent experience on this and I was terrified when giving my gifts for Christmas. I buy and sell used and new clothes online, so I thought what a better way to give them these great gifts from something that I love looking for. I can say that it was a success, I believe its more about your effort to find something that you believe is something they will enjoy. It turned out even better than I could have imagined. Thought that counts right! I love that your family embraced the “spirit in which it was given” thing. Those are the people I want to buy gifts for! Welcome to crunchy CO. I really appreciated going to a kiddo’s birthday party over this past summer where the mom responded to my request for what the kid might like by asking if we had any hand-me-down bath toys that my daughter could part with. Since they’re only 2 months different in age we didn’t have anything age-appropriate that we don’t use, but I thought it was a great idea. For Christmas this year I asked for a super thin spatula like my mom’s but apparently those are pretty much all antiques so rather than make me wait for her spatula as an eventual inheritance, my parents went to a flea market and found something almost as good (though a little awkward since the handle is bulky – it’s hard to explain but if you squeeze the handle the spatula head rotates to release whatever was picked up with it which is interesting, but again, awkward). A used bike in good shape is very reasonable since she’s still outgrowing bikes. I love the used-bath-toy request! We went to a birthday party for a girl turning 5. Her mother put “No Gifts Please” on the invitation, and as a gift-shunning mom myself, we bought her a very nice helium balloon and a card for the party. We were the only ones who showed up without a gift. We go to a lot of ‘no gifts please’ parties. I read in a Parents magazine that if the invitation says no presents, you should respect that. So the first ‘no gifts please’ party we went to we went with a card but without a gift. Imagine my surprise when there were a few presents! And then I got an email a few days later, “there was a present without a card, was it from you?” Um, no. I wrote back that it was not – we had read that ‘no gifts’ means ‘no gifts.’ It was embarrassing! But I think the word has gotten out – there are fewer gifts at the parties these days, and I think they are usually from family. Wow, I wish that I could instill this. The compromise we’ve come up with is to really think about what our kids need and then tell the relatives that if they must give a gift, we strongly suggest these. I think it depends on the gift. A bike for instance, l think it’s okay to give a used one, especially if it’s still in good shape. A train set, a used doll house, vintage stuff. I don’t think the kids would care too much. Clothes? Maybe not. I have purchased stuff at thrift stores with ever intention of wearing them, but could never bring myself to. My husband on the other hand, loves shopping there and has no problems wearing them either. I say get the bike. Kemkem recently posted…A little bit of financial disclosure! Embrace is correct! I have come across more brand names items that are brand new without a tag, you would be shocked. I jokingly say I wear more expensive items now from buying at a thrift store than I ever have before. For example I would never spend $80 on a Polo Ralph Lauren shirt, but when you find one in a thrift store for $3, it’s hard not to wear it as a badge of honor. We’ve given our kids (7 & 10) used items for gifts before, and they had no problem with it whatever, but I think I’d get less than gracious responses from my siblings if I gave my nephews or nieces used gifts for their birthdays or Christmas. Although they all like getting hand-me downs when there’s no occasion. Our son’s current bike was bought used, but it was a lot nicer bike than we would have bought him brand new. And, for this last Christmas, the one thing he really wanted was a desk for his bedroom. We found a decent one at a goodwill for $10, and he has been very happy with it! Then, he decided to ask Santa for a disney infinity game…we found one on Craigslist for almost half-price! Our daughter also has a thrift-store desk in her room (from a past birthday), but you’d never guess that’s where it came from, and she loves it! I guess I am a little afraid of giving a used gift to someone other than our children. I really don’t think my kids would care about where they came from. Yes, I have given used gifts on numerous occasions, and I wouldn’t turn up my nose at a used gift myself (I particularly love antiques). It depends on my comfort level with the recipient, though–if it was someone I didn’t know very well, I’d most likely purchase new. But, my siblings, parents and immediate family couldn’t care less–we’re all accustomed to hand-me-downs, and appreciate good quality over newness. This past Christmas I gave my husband a really neat chess set from Goodwill. My oldest received many gently used Peek-a-block toys for his first Christmas. I don’t feel bad. Often it’s not so much thriftiness on my part, it’s just that the really great things I want have been discontinued. Buying used does help stretch the budget, though. We may be jerks [….] but we give used gifts all the time. Having a baby? We’re going to lay used baby clothes on you, like you never need to buy anything. That is, of course if we like you. My favorite was we gave some old juice containers to a friend who liked to camp. No reason to pay for that expensive Nalgene crap. I don’t think you are jerks at all. Frugal is just fine with me. I think that is a good point, too. Most kids, up to a certain age, wouldn’t even notice. Meant to say thanks for mentioning my answer from last week! How rude of me. Thanks. My Dad gave me a used 3 speed Glider bike for my birthday 40 years ago around my tenth birthday. I thought it was the coolest gift ever… 3 speeds! I rode it for years. It was too large when I first got it. I remember leaning it against the fence and haing to stand on the garbage can to get on. He took the time to carefully repaint the frame, fire engine red. The time he put into restoring that bike was the best gift of all. We didn’t have much money, but my Dad put creative effort into our gifts. He is near the end of his life now at age 86, and that is one of the fondest memories about him I will have for the rest for my life. It’s not about the cost of the gift,whether its new or used, its about the thought, time and effort put into it. What a lovely story. Thank you for sharing. I can imagine the memories that bike gave you. Hi back attacha Mr. 1500! Thanks for recommending my blog. Much appreciated! If you are looking to unload any winning lottery tickets, old stock certificates, or first-generation Barbie dolls, send them my way. My dad had found it – somewhere – and my mom was actually a bit upset that he didn’t put any effort into making it look presentable. In fact, before I could even learn to ride it, I had to spend HOURS with a rag and some gasoline to remove the rust off the wheel rims, spokes and handlebars and make it all shiny again. My mom promised that we would paint it whatever colour I wanted, but honestly by the time I got it all cleaned up, I just wanted to learn to ride it – and once I was riding it, I never looked back. So I think as long as the bike is in good shape, and you are fair with each kid – i.e. all kids get used bikes, not one kid gets new and the others get used – bikes are fine used for your own kids. For other people’s kids, I would probably not give used, at a special occasion like a birthday or christmas, unless it was family and I knew the person I was giving to. If I had a used item that I thought would be useful for someone else, I would offer it to them just as a random thing – not for a special occasion. I think this answer pretty much sums it up. Thank you for reading. And yes, they will both be getting used bikes – the little one gets the bikes the bigger one outgrows. Double used! But when she is big enough, she will have her very own, new-to-her bike that her sister never rode. I have to agree with some that it depends on my comfort level with the recipient, how I think they would react, and what the gift is. I haven’t given pre-owned stuff as gifts, but more I bought it just because and I thought they would like it. With immediate family, though, I don’t think it matters too much – I grew up on pre-owned stuff (bike included). Thanks for including me in the list! I think if the gift is for your own daughter, that’s a green light. You avoid any sort of social stigma, and can actually make it a teachable moment, too. Like Mr. 1500 noted, a quality used item is more desirable than an inferior new one. I wish my parents had taught me that early on. Done by Forty recently posted…Did Americans Really Overpay by $1B at Tax Time? The teachable moments are what I am looking for. Hi Mr and Mrs 1500. Thanks for the inclusion in your article. We are getting off to a very Fast start. Our son is due in 2 months, and in 15-18 months we intend to take a year off of work to travel North America with him. I grew up in a family where many, MANY, birthday and Christmas gifts were used items. I think it’s a great way to recycle, provided it doesn’t pose a health risk to anyone. By that I mean it’s something that can be cleaned, like clothes or a bicycle, and not a plush stuffed animal. Fast Weekly recently posted…What Does Your Goal Look Like? Hey Fast Weekly. If you are traveling North America with Little FW, I strongly urge you to get an Ergo Baby Carrier. More expensive up front (and can be found on Craigslist used for almost-new prices) but so much more comfortable than any other carrier made. Figure out what Little FW likes to do in the car, and bring a ton of that! Good luck! I think it’s perfectly okay to give a used gift, but probably only to your own kids, as others might be offended by that? Rick’s aunt, when she was around, used to give all of her grand-nieces and nephews used children’s books for Christmas that she had picked up at various sales during the year, and that was always one of our kids’ favorite gifts. I loved it because it was educational. That frugal woman left each of us nieces and nephews a close to 5-digit inheritance when she passed. Oh yea, as long as you know it’s of nice quality, there’s nothing wrong with giving used. Bikes get a special mention because their quality doesn’t even really diminish with time. You could always give it a new paint job and swap out the old gear shifter. It’s absolutely okay to give someone a used gift! Especially kids, since they don’t usually care, and it will be in used condition pretty soon after anyway! If giving a used gift means being able to give more, or something of higher quality, then by all means! It’s a good lesson for kids to see how much more they can get when buying second-hand items. I think it all comes down the person to whom you are giving the gift.. For example, for your daughter, I think a used bike that is in great shape is an excellent gift! For family or those close to you, I think used is OK there too, likely with some exceptions (but, for example, I got my sister a box of used books for Christmas, and she liked though even though they were used). If it was for a stranger or someone I was not close with, then I would hesitate to buy a used gift for them, just because I am not sure of their values and how they would take it. Prudence definitely made a huge debt in that business debt. Over $40k to pay down debt, that’s freakin awesome. Yes, that was extremely impressive! I think for children, especially if the item is still in good condition, it is totally appropriate. I remember getting used CDs as gifts growing up too, so even used books and other media I don’t mind as an adult. Honestly, if I could get a HIGH quality item for a gift, like a good condition fabulous leather bag, and the person who bought it was able to get it for a great price because it was second-hand, I would totally be ecstatic for the gift. But not all folks are big on second-hand so it does depend on the gift recipient. On our last thrift store run, we found a number of items for our kids’ birthdays. The oldest daughter is getting an old skool Lite Bright set that looks like it was brand new. They actually had a selection of 3-4 varieties of Lite Brights, and we picked the best one. $2 I think. The 2 year old got what looks like a brand new 4 wheeler ATV for $25 (max speed 2.5 mph so don’t worry!). It had some fairies on it, but as my daughters said “it’s green, that’s boy colors”. I asked the sales clerk if it was new and she said probably. They often get donations of new toys. The 2 year old is also getting a brand new train set (from the same thrift shop). The price tag was still on it ($19.99 retail), and the “press here to hear sounds” button still produces little chug a chug a choo choo sounds. $7. Even though we saved a ton of money on gifts, the biggest benefit is that we taught our kids a great lesson. It’s okay to buy stuff that is used or brand new (but from a second hand source). And it’s okay to give it as a gift. They are just things. My middle daughter was a little disappointed that we didn’t get the $20 bicycle. I had it in the cart then realized it was the same size as her old one (we needed the next size up). She was so excited to be getting this new (to her) bike, she didn’t care that it was a little scuffed up. The kids were stoked at all their thrift shop finds. So many awesome clothes (some brand new with tags still on). Nice work at the thrift store (now I’ll have that song in my head for the whole day). Yes, this is an awesome lesson and I wish my parents would have done the same with me. I never went to a thrift store until I was in my 20s because I thought it was beneath me. Now, I love going to them. It’s like a treasure hunt. Hi back to you, Mrs. 1500, and thanks for the endorsement! Hopefully we’ll be seeing you guys in Vermont and/or Colorado soon! Yes. PLEASE. PLEASE give me used gifts that are useful. I don’t want used bath soaps or stuff I won’t use or don’t want to use, but I certainly wouldn’t turn away a high quality or older model of something that is well made and something I need. Just the other day a kind friend dropped off a used electric breast pump, made in Switzerland. You simply can’t find those things any more (it’s all made in China), and I was ever so grateful for the gift!!! !